Man and monster alike hide dark intentions. In describing the elements of horror in his book Danse Macabre, Stephen King outlined the dual concepts of “terror” and “horror". Whereas horror has its focus in repulsion and physical reaction, terror is more a product of the mind, the result of a prolonged, haunting sense of dread of something which may not not be strictly obvious or visible. Especially referring to the E.C. horror comics of the 1950s, sold prior to the instillment of the Comics Code, King deemed the comics “the epitome of horror", emphasizing their unique illustrative ability in depicting physically gruesome and disturbing imagery. In a modern era with books like Cullen Bunn’s Harrow County, however, horror comics have moved beyond cheap shock value and gore, instead aspiring to create the proper blend of horrifying imagery and terrifying narrative. 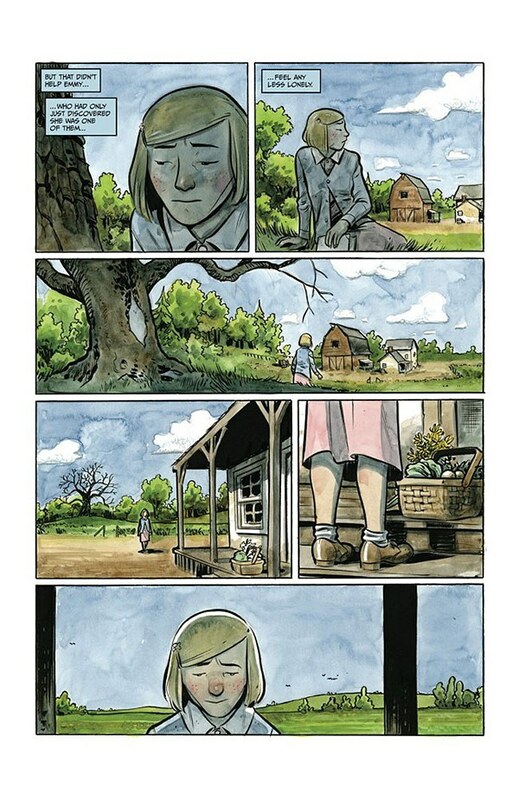 In Harrow County #5, Bunn continues just this kind of journey, where the dark subtleties and secrets of small town living are far more unnerving than any of the ghosts or monsters haunting the night. 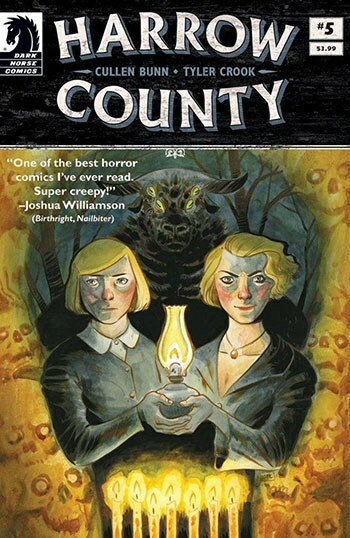 In Harrow County, a young country girl named Emmy comes to terms with the haunted history of her southern hometown, which is host to an assortment of creatures and ghosts, called “haints", within its woods. She also learns that she is apparently the reincarnation of a wicked witch from long ago named Hester Beck, who was the “mother” of these creatures (not unlike Game of Thrones' “Mother of Dragons", Daenerys Targarean). Beck also used her powers to create many of the townsfolk out of clay, and eventually these new creations turned on her and killed her. Now, many of these creations and they’re descendants have now realized that she’s back. Whereas the past few issues have focused on Emmy’s encountering these creatures and learning of her terrible fate, issue five instead focuses on Emmy’s embracement of this role, acting as a kind of ambassador between the townsfolk and the creatures. The issue begins with Emmy lamenting the fact that she seems to be the only one of her kind, emphasizing her loneliness despite being a part of two separate worlds. Despite being a “witch", Emmy is revered by the town because of her arcane abilities, such as healing, and thus receives a wide variety of gifts. Emmy is then called upon by one of the townspeople, who has some sort of creature living in his shop’s attic. When Emmy goes up, she finds a goblin-like creature inhabiting the attic. She manages to come to make a deal with the creature, that if the shop owner agrees to feed the creature periodically, it won’t cause any more trouble. The townspeople, however, seem shocked that Emmy has not removed the creature entirely. 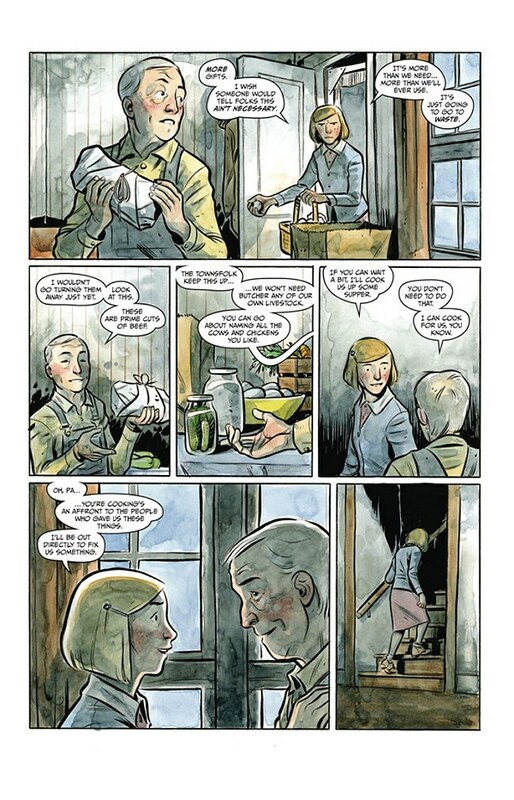 The anxiety of the people of Harrow County is one of the comic’s biggest strengths, and is an effective example of the comic’s embracement of terror over horror. As the narrative progresses, the underlying context of the townspeople’s bubbling fear and paranoia, especially given their past propensity towards violence, provides a lingering sense of unease. The relations between not only the townspeople and the “haints", but among the townspeople themselves, are persistently tenuous, and makes the scenario more akin to a boiling feud than a haunting. This agitation is further exemplified when Emmy is confronted on her away out of the shop by a resident named Mr. Webb, who asks Emmy if she can do something about a man, Thad Cribbets, who is eyeing his wife. When Webb suggests Emmy curse Cribbets, Emmy walks away, disgusted. Even as Emmy walks away, threatening Webb never to ask her to do such a thing, Webb’s shadowed figure suggests a silently building temper. Emmy then proceeds to visit a few of the “haints” living in the woods, including a collection of four ghosts who haunt a graveyard in the woods, and a large Minotaur-looking creature hiding in a shed. The cynical creature warns Emmy that one day, she may not be able to manage the townspeople the way she has been so far, and that the “haints” may not be there to help her. The fact that the creature has the strongest southern accent of any of the characters in the story seems to emphasize the very human fervor and resentment plaguing the county, and reinforcing the story’s Southern Gothic atmosphere. Emmy ultimately returns home and reunites with her friend, Bernice, who she hasn’t seen since the two found out about Emmy’s wicked past. Emmy tells Bernice that neither of them has to live by the actions of Hester Beck, and that the two of them can weather the upcoming storm together. The friendship between the two characters is a well-developed grounding point, providing perhaps the story’s sole instance of dedicated decency and loyalty between any two characters, save for Emmy and her father. As the two friends talk, a car pulls up in front of Emmy’s house. A woman emerges who bears a nigh-identical resemblance to Emmy, and who declares Emmy her sister. Emmy is ultimately left reconsidering whether she’s so alone as she thinks. Harrow Country #5 is another strong chapter in an impressive new horror saga, one that knows how to both horrify and terrify in a proper balance. Seasoned artist Tyler Crook helps manage this balance by positioning imagery such as the talking, disembodied skin of a dead boy alongside the more subtle, hidden feelings of a wary human face. With an understanding of what makes people haunting to one another, Harrow County explores the terrors of the unknown in both the natural and supernatural alike. Ultimately, they’re not so different.